Providing for and loving on our kids is what we do as parents. We provide life’s necessities, provide discipline, offer advice, etc. Giving money tips to our children has to be a top priority as well. How do you talk about money around your children? 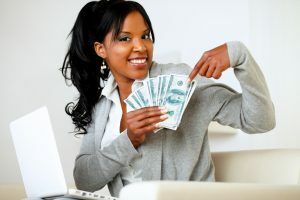 Are you showing control of your money? Are you showing that money has control over you? How we treat our money and talk about our money sets the example of how our kids will handle their money in the future. Of course there are caveats to this but we should still do all we can to be positive influences. 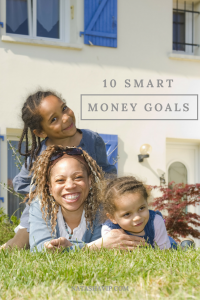 We can show our kids how we manage money by taking them on grocery shopping trips, showing them how to manage their allowances, giving to others in need, etc. They need to see real examples of money at work for the family. I know money can be a taboo subject. It is a subject that many people do not like to discuss. But times are different. Kids are becoming entrepreneurs now. We’re still recovering from an economic disaster that began in 2008 where too many people bought more home than they could afford. It’s time to be real with ourselves and be real with our kids. Not only so they will understand the financial state of the family but to become responsible managers of money as adults. 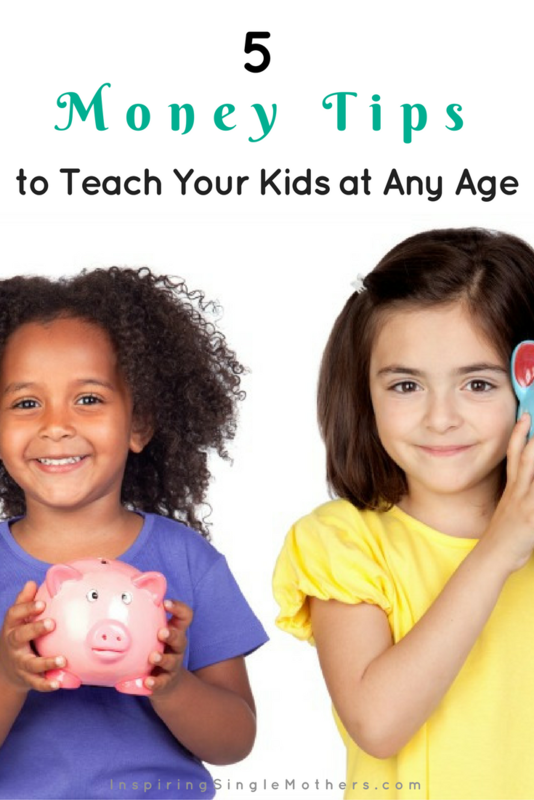 In 5 money tips to teach your kids, let’s talk about how we can begin to lay a strong financial foundation for them. Whether your kids are receiving an allowance or are old enough to have jobs, teach them to save a portion of their money first. It’s the same principle that adults should abide by. Discuss with them the importance of saving and the amount to be saved each time. Go further by taking them to open their own bank account. Take them to make the deposits themselves. Show them how to properly fill out the deposit slips. Allow them to fully manage their accounts. My daughter has her own savings account plus she likes to keep some money at home. She decides how she wants to spend (or not spend as she’s a big saver) the small amount she keeps at home. Furthermore, make sure they see you saving money as well. Although the majority of our money will be saved through automatic allocations, I like to keep a small side account where I can show her how I’m managing that pot of money. Just like we budget our money, our kids should learn budgeting early. It sets up good habits and shows them that money definitely does not grow on trees…ha! Use my free printable, the Simple Budget Tracker, for yourself and the kids. They should have at least 3 categories – saving, spending, and giving – for now. When they start jobs or depending on you all decide to set up their budget, they may break these categories down a little further. By doing so, they’ll know where every penny of their money is going be it food, entertainment, gadgets, etc. Nothing wrong with that at all! Spending is a huge part of our budgets and kids’ budgets are no different. Like I stated above, they may want to purchase their own fun and gadgets. This is a good time to teach them how to look for deals, what is a good deal, and also the importance of delayed gratification. Just like we as parents can’t buy everything we want at once and must plan for those things, our children need to learn this important principle as well. Also, there’s that little saying that just because you want it, doesn’t mean you should have it. I don’t advocate giving our kids full reign over their spending choices when it comes to certain items especially electronic devices. So, this is something to talk through with them as well. What are the spending limits? What’s a need? What’s a want? Just some of the questions we should be working through with our kids. Currently, my daughter’s giving involves offering a share to our church. I plan to step this up where she not only gives her money to a charitable cause outside of church but also gives her time on a regular basis, not just special occasions. So, when talking to your children about giving, allow them the opportunity to select a cause that’s close to their heart. My daughter has a special love for younger kids and children with special needs. So, our goal is for her to be able to volunteer in some capacity with a kids’ organization. We know how good the act of giving feels, so let’s make sure our children learn this important concept now. When they become adults, it will be second nature to them. It’s important that my daughter truly understands how blessed she is and that we have to be not only good stewards over our money, but giving stewards. Yes, this is a strong subject but one that has to be discussed with our children. As adults, we may still be learning to manage credit better and paying off debt. But don’t allow that to make you feel unworthy of teaching your children how to use credit wisely. You did, you lived, you learned. Now you can show your children how to do this the right way. Credit is an important financial tool. Teach them now about credit cards and that they should never carry balances from month to month. Teach them to not overburden themselves with credit. For instance, we don’t need 10 credit cards or department store credit cards. Teach and show them that one is enough and receiving a store discount isn’t worth damaging your credit. Teach them now that the more money they save for a down payment on a home, the less money they need to borrow for that home. Teach them now that they don’t need a car with a $600 car payment. Show them the peace you feel by not being overloaded with debt. Show them and allow them to celebrate in the family’s financial wins. Show them that this is a step by step process and it’s not perfect but by working together as a family, you’re going to come out on top eventually. What money tips have you taught your children? Love this post, working in debt management I’m a huge advocate for financial education. My famous last line is “Would you throw your child into the deep end of a swimming pool without teaching them to swim first? 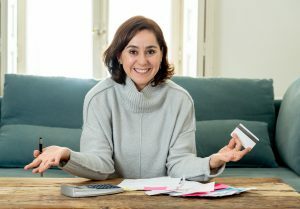 So what’s the difference!” We are bombarded by offers of credit from the minute we hit adulthood, how are we expected to handle it without some prior knowledge of how it works? It really makes me smile when I see people like your good self being proactive about educating your kids about one of the mist important things in life! Thanks so much David! I appreciate you taking time to visit and comment here. Yes, I’ve paid off a lot of debt and still paying off a bit. I truly believe in early financial education. We need to send our kids out into the world prepared and with a true understanding of how money and credit works.